First, the British Bankers' Association reported that the three-month dollar Libor rates were fixed at 1.30%, down from 1.31% on Monday. This has been a slight improvement over the last week. 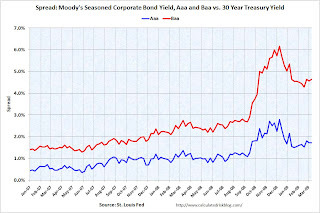 The first graph shows the spread between 30 year Moody's Aaa and Baa rated bonds and the 30 year treasury. There has been some increase in the spread the last few weeks, but the spread is still way below the recent peak. The spreads are still very high, even for higher rated paper, but especially for lower rated paper. There has been improvement in the A2P2 spread. This has declined to 0.84. This is far below the record (for this cycle) of 5.86 after Thanksgiving, but still above the normal spread. This is the spread between high and low quality 30 day nonfinancial commercial paper. Meanwhile the TED spread has decreased a little over the last week, and is now at 107.5. This is the difference between the interbank rate for three month loans and the three month Treasury. The peak was 463 on Oct 10th and a normal spread is around 50 bps. 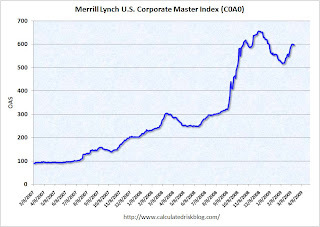 This graph shows the at the Merrill Lynch Corporate Master Index OAS (Option adjusted spread) for the last 2 years. The recent surge in this index was a cause for alarm, but the index appears to have stabilized over the last week. All of these indicators are still too high, but at least none of them are increasing this week.